We were provided with overnight accommodations to facilitate this post. Opinions are my own. When we decided on a date for our road-trip to Put-in-Bay I immediately went to Lake Erie's Shores and Islands website to plan our stay. Transportation to Put-in-Bay was provided by Miller Boat Line. Read part one of our mini island vacation and see some of the sites through our eyes. Shores and Island's website has everything you need to plan your stay from lodging to events. They also have a handy itinerary planning tool to assist you in creating the best vacation possible. As a bonus, they are running a fantastic sweepstake right now just for creating a vacation plan and emailing it to them - hurry it ends 6/29/2015! First up was where to spend the night. I wish we could have stayed longer but we did not find out until the last minute that we could have spent another night due to the Hubs' schedule, but the weekend we went was a popular weekend! It was Pyrate Fest! Pyrate Fest is a five-day festival dedicated to pyrates and the landlubbers who love them. Lucky for us, they didn't arrive until Friday and Put-in-Bay Condos was able to provide us lodging for the night as well as a golf cart when we arrived. 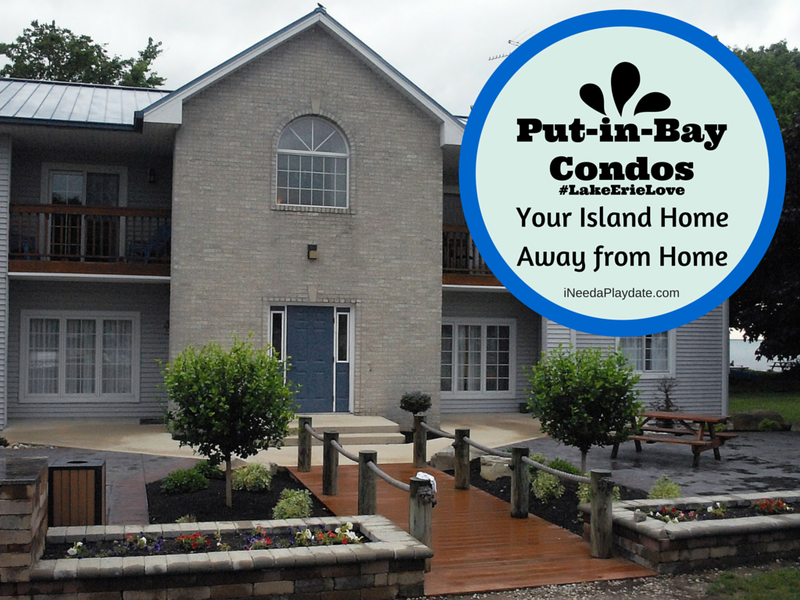 There is an extensive list of places to stay on the islands as well as in Sandusky and the surrounding area on Shores and Island's website but given the opportunity, I'm not sure we would want to try another place after spending the night in the condo. Nicely furnished, spacious and clean the Put-in-Bay Condos really made our stay enjoyable. Since we were only spending the night, we were provided with linens but if we stayed longer we would have to supply our own, but besides that they offer all the comforts of home. Actually that would be a comfort from home so they really do feel like home. Minus WiFi. Boy did we have a chance to bond as a family! If I had my dream home it would be layed out so the kitchen opens up to the rest of the house just like in this condo. The kitchen has plenty of cups, dishes and utensils in their cupboards as well as pots and pans which means that there is no need to eat out the entire stay. There is also an in-suite washer and dryer, which would certainly come in handy for extended stays. When we arrived it was raining on and off so the pool was out of the question but that did not stop us from getting our feet wet and exploring the grounds. As much as I like to take pictures, the Hubs is a photographer and he really outdid himself with not only our family picture out on the fishing pier but just fun photos of our trip. See more of our trip on Instagram...!